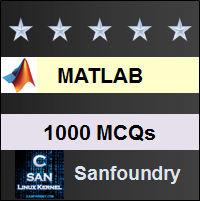 This set of MATLAB Multiple Choice Questions & Answers focuses on “Sparse Matrices – 2”. Explanation: There is syntactical error while giving input to the nnz command. The input to the nnz command should be within parentheses and here the input is within . If the input was given within (), the output would’ve been 4. Explanation: The spones command returns a sparse matrix with ones replaced by zeros. Hence, Returns a sparse matrix with the zeros replaced by ones is correct while rest of the options are incorrect. Explanation: The spones command also creates a sparse matrix. Hence, the newly generated matrix will have the same size as that of a sparse matrix. Explanation: There is no error in the above code. Since, the if command is not ended, no output will be generated. If the if command was ended, the output would’ve been Yeah !. Explanation: The spconvert command converts the original matrix into a sparse matrix by only keeping memory for the elements in the columns. Since in the above matrix, there are no non-zero elements- the total space occupied by the new matrix is 3. Explanation: The matrix generated by the spconvert command consists of non-zero elements from the columns of the original matrix. Hence, 3 is correct. 7. A memory for sparse matrix is dedicated by the ______ command. Explanation: The spalloc command is used to allocate memory for a sparse matrix. The rest of the commands are incorrect. 8. What is the output of the following command? Explanation: The spalloc command will allocate memory for 2*3 matrix due to the above code. There will be no error. 9. The default number of non-zero elements which can be put into the memory allocated by the spalloc command is > 1. Explanation: Even only 1 element can be put into the memory which has been already allocated by the spalloc command. Hence, the above statement is false. 10. The pattern generated by the spy command is a measure of the number of zeros in the input matrix. Explanation: It is actually a pattern of the number of non-zero elements in the input matrix. Hence, the above statement is false.